The AFA from Park Ave.
We are moving forward with site preparation for the new Admission and Financial Aid Center (AFA), which will be constructed on the southwest corner of the intersection of Park Street and Eighth Avenue. This makes it necessary to relocate the Center for Religion, Spirituality and Social Justice (CRSSJ), as well as three student language houses. The design for the AFA is still in development, with construction scheduled to start in fall 2017. Current plans call for the AFA to open a year later, in the fall of 2018. The CRSSJ currently occupies a two-story house, built in the early 1900s, that will be razed this summer to make way for the new AFA. The CRSSJ will move across Eighth Avenue to a one-story, College-owned house at 913 Eighth Avenue. To accommodate the CRSSJ’s varied and special needs, we will extensively renovate, remodel, and expand 913 Eighth Avenue to create a fitting home for the CRSSJ and its many programs. The new CRSSJ will include respectful space for students of all religions and spiritual traditions. We will construct a 17-foot by 20-foot addition onto the back of the building to create two separate, dedicated prayer spaces to serve students of Hindu and Muslim traditions. President Raynard S. Kington reviewed the design for the proposed addition and gave the authorization to proceed. The students served by the new prayer spaces will be invited to provide input on paint colors, furnishings, and décor. Providing dedicated prayer spaces is an expression of our fundamental commitment to diversity and inclusivity. The new CRSSJ will also include a lending library, meditation space, multi-religious library, and a large worship and prayer space. The entire first floor of the new CRSSJ will be accessible, a major improvement over the current space. There will be a ramp to provide wheelchair access to the building, which will also include a fully accessible restroom. Construction work on the new CRSSJ is already underway and is scheduled to be completed this summer. We expect the CRSSJ to move in well before students arrive for the fall 2017 semester. To clear the site for the new AFA, the Chinese House, German House, and Russian House, which are home to a total of 24 students, will be physically moved onto new foundations being constructed on the west side of Park Street just north of Eighth Avenue. The construction and move are scheduled to occur between June and September 2017. The relocated language houses are expected to be ready for occupancy in October 2017. 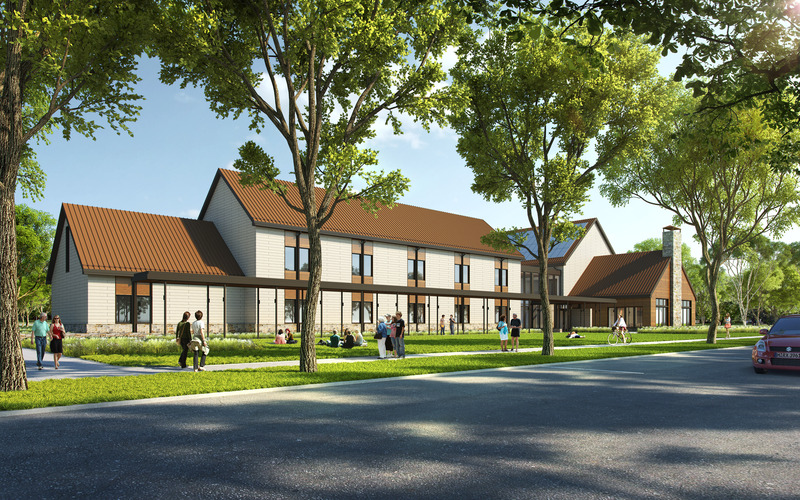 We’re exploring options to provide suitable temporary housing for residents of the relocated language houses at the start of the fall semester until they are ready to be inhabited. The current Reading Lab at 1321 Park Street will temporarily move to a College-owned house at 1204 East Street the week of March 20, 2017. The lab will remain on East Street until it moves into the new Humanities and Social Studies Complex (HSSC), which is expected to be completed in summer 2020. The HSSC will be the new home for both the Reading Lab and the Writing Lab. The Park Street house will be razed before the end of this semester to clear space for the relocated language houses.